Mesa Engineering changed electric guitar forever when the original Boogie combo appeared on the market in the early 1970s. Randall Smith’s cascaded gain preamplifier was just one of a series of innovations that catapulted Mesa to the apex of the guitar amplifier manufacturing market in a few short years, and made the Boogie a musical instrument in its own right. Most amp designers would have been happy to stop there, however, in 1991 Randall Smith did it all over again with the amplifier that’s become synonymous with modern rock and metal, the almighty Dual Rectifier Solo. Developed as a tonal ‘fork in the road’, it started with the Mark 1 Boogie increasing lead gain and aggressive tone modifications courtesy of the Boogie’s built-in 5 band graphic EQ and developed later Mark 2 and Mark 3 versions. By this point many modern rock players were using a savage, scooped mid tone combined with a liquid treble and tight bass. Mesa sculpted and refined these core tone elements, adding a massive power supply for super-fast response and joined them to new visuals - basket weave and hardwood were replaced by black vinyl and aluminium checker plate. Now, almost every amp modelling solution features a sound called ‘Rectifier’. The Dual Rec’s huge tonal spread and staggering dynamic range is difficult to replicate digitally, but newer products have made improvements. The Dual Rectifier’s iconic double decker control panel is home to three channels. Channels 2 and 3 each have three different modes called Raw, Vintage and Modern and can be preset to use all of the Dual Rec’s 100 watts or a half power 50 watt option. The Vintage setting is where many of the rectifier’s most-copied tones are found. Raw mode has less gain, Modern has more. The feature that gave the amp its name is the ability to select between valve or solid-state rectification, not only that but you can pre-set your choice for each channel. Solid-state rectification maximises power output and clean headroom, while valve rectification adds more dynamic response and touch-sensitivity, paradoxically working to best effect on lower gain settings. 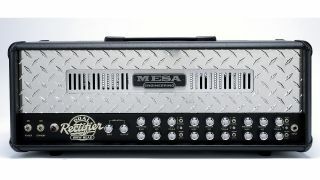 The rectifier selection feature is crucial to the amp’s versatility. The Dual Rec can be switched between EL34s and 6L6s from a handy rear-panel toggle. The sonic difference is noticeable – a lighter but tighter bass, less high-end response and a more forward midrange give the Dual Rec a different slant; modern EL34’s are not as robust; for tone and reliability, stick with the 6L6. The bone-crushing rhythm crunch that made the Dual Rec’s reputation comes from using a generous dose of gain in Vintage mode, scooping out the midrange and keeping the bass and treble quite high but not too extreme – the Rectifier’s treble control strongly affects the gain structure and tiny changes make big tonal differences. This is best used with solid-state rectification for the fastest response. The Dual Rectifier’s clean channel is often overlooked, but offers a wide range of subtle low to medium gain drive effects, especially when being used in ‘Pushed’ mode. This mode is so versatile it’s actually become a favourite for many, blues, classic rock and even country players. The bouncy, high-headroom clarity works best in valve rectifier mode with just a dash of chorus. During the 1990s the Dual Rec became synonymous with the modern wave of heavy metal pioneered by bands such as Metallica, Korn and Slipknot. The Dual Rec’s fluid, sustained lead sounds are often brought forward in the mix by using more midrange, emphasised in the amp’s Modern mode, where the gain levels are so insane they, frankly, teeter on the edge of stability.